I don't quite remember how I ended up landing on Jessica's shop but I'm glad I did! I'm the biggest baby when it comes to taking pills but maybe if they were in one of her awesome pill bottles the whole ordeal would be easier to swallow. The "Someday I won't have to take these anymore" bottle is my fave. I grew up in Denver and moved to NYC going on seven years ago. My boyfriend Evan and I live with our cat, Miró, in Greenpoint, Brooklyn. It's a great neighborhood—especially since Evan's wonderful sister and many of our good friends live in a five-block radius of us! 3. Can you briefly describe the glass etching process to us newbies? I actually learned how to do it from Martha Stewart! Before the Internet was everywhere, she used to have these binder cards you could subscribe to that would be mailed out every month or so of recipes, decorating ideas, projects, etc. One of those cards was about etching drinking glasses. The same tutorial I learned from is now on her site. 4. Can you share one or a few of your favorite short short stories that you've written. “Get outta the water!” she screams from the beach, her floppy straw hat sadly a shade deeper than her floppy thighs. I bob and stare. From this distance she is a looming mass in purple Lycra, her mouth a dark slash, her eyes like pin pricks on bread dough. I feel my stomach, my thighs. Puberty is cruel. Puberty is turning me into her. Pretty soon I will stop floating and drown. I slide onto my back and let myself drift further out. The sea is a much more delicate mother. 5. I love that you try your hand at every craft at least once. 6. How did you come up with your etched bottles? I’d say there were three big things sparked the idea. The first happened when I was on a group trip in Italy studying art history just before graduating college. We had gone to a former monastery that’s now a museum (I can’t remember the town). On display were these small glass bottles from ancient Rome. Our professor explained that it had been customary, when someone passed away, for the mourners to collect their tears in these bottles, which would then be buried with the dead. I was entranced with the idea of literally bottling emotions. The second big thing was seeing Kiki Smith’s “Untitled” bottles (12 glass bottles, each with the name of a bodily fluid etched on it) on display at MOMA. That got me thinking about storage and etching. Not necessarily storing bodily fluids, mind you. More the process. Lastly, some time ago I was prescribed a medication that I wasn’t too thrilled about. Maybe it began as a form of avoidance, but I decided to put those pills in a bottle onto which I’d etched “Someday I Won’t Have to Take These Anymore.” It all took off from there! 7. 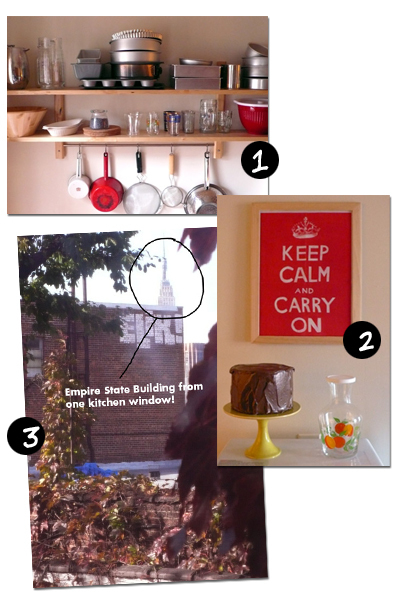 Can you give us a tour of your "tiny Brooklyn apartment"? 1. Shelves above our kitchen table that hold many of my favorite things...baking pans, table wine glasses, my red mixing bowl. 2. Again, in the kitchen. On the toaster: Amy Sedaris fake cake on a lovely cake stand by Potluck Studios and a thrift store juice carafe that I love the design of. In the frame: handout at Maira Kalman's show for The Principles of Uncertainty (she illustrated the famous poster in her book of the same name). 3. Our view of the top of the Empire State Building from one kitchen window. 4. Our chunky cat Miró and a beautiful mobile Evan's grandfather had made decades ago. 5. Pretty obvious...I love sleep! 7. A photo I found at a flea market. I love the colors, the woman's pose, everything about it really. I dream of working from home in a big, light-filled studio someday, but my current job as a graphic designer for a book publishing company is pretty fun, so I'm not complaining. For now. 9. What was it that made you want to start creating? Did something specific trigger it? Yes…Birth. Seriously, I’ve been making things for as long as I can remember. 10. Can you give us a little background info on your amazing food blog - pictures of cake? Can you remember an exact moment or event that triggered your obsession with cake? It wasn't a specific moment, but rather a specific time in my life that this all came into focus. I'd been living in a series of dismal apartments, unhappy and in a bad relationship. In the span of a month, I moved in to a lovely place with a good friend and the bad relationship ended. Have time on my hands as well as a decent kitchen, I started baking more and more. I'd done it occasionally most of my life, and have always loved cooking and cookbooks, but the baking really took off with a vengeance. I started baking cakes for any and every occasion. The blog came about for completely therapeutic reasons. I was really unhappy at my job at the time, and found that looking at pleasant images brought my mood up from 9-5. I especially was in love with pictures of beautiful cakes. Looking around the Internet, I could not find a site that was cake- and image-centric, so I decided to start my own. From there, it's just grown. I bake as much as I can, am working on a book about cake, and I bring in a different cake that I've baked to my office every other Thursday. The event of sorts is called Cake Thursday. Co-workers are invited to come by for a slice at a specific time. It's turned in to a really fun, anticipated thing! Okay....how adorable is Jessica? She sounds like a doll and so fun! I love those bottles, they are awesome, her apartment is so sweet and I LOVE that fake cake! Thank you for this interview, it was so much fun to read! I just love the pictures of the crumpled pillows. It makes me feel all cozy...now I want to go home, curl up in my bed with a good book.